Facebook will launch a satellite later this week that executives hope will bring Internet connectivity to parts of sub-Saharan Africa. Facebook co-founder and CEO Mark Zuckerberg mentioned the launch during a town hall discussion in Lagos, Nigeria with developers and members of the Facebook community. While talking about building an infrastructure that would enable people anywhere in the world to access a signal, Zuckerberg said Facebook is launching a satellite to beam down connectivity. "If you want to connect everyone in the world, then making sure that everyone has access to the Internet is a really important thing," Zuckerberg told the group in Nigeria. "It turns out that across the world, more than half of people don't have access to the Internet. Here in Nigeria that's true too." 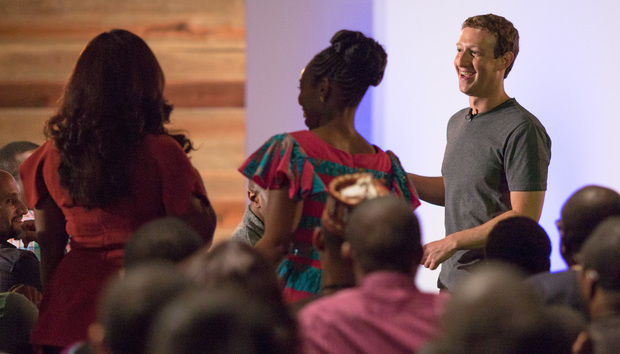 In a visit to Africa largely focused on spurring entrepreneurship and developers, the Facebook CEO said he's been inspired by what the people he has met this week are trying to build, like the LifeBank app that is focused on mobilizing, inventorying and delivering blood donations. "Whether what you care about is connecting people with their friends and family or helping people start business, the Internet is one of the most fundamental parts of infrastructure that needs to exist," he said. SpaceX, one of the companies that launches cargo ships to the International Space Station, is set to launch the satellite for Facebook at 3 a.m. ET Saturday from Cape Canaveral Air Force Station in Florida. Facebook is using space on the Amos 6 communications satellite, owned by Israeli-based Spacecom. The satellite is launching on the SpaceX Falcon 9 rocket. The effort would fit with the company's expansive efforts to bring Internet connectivity to more of the world. Facebook executives frequently note that about 4 billion people around the globe - or 60% -- lack access to an Internet connection. And for several years now, Facebook, along with rivals like Google, has been developing technologies to spread connectivity to rural and poor areas around the world. Just this summer, Facebook announced that it had completed its first full test of a high-altitude, solar-powered, unmanned aircraft that beams Internet connectivity down to Earth using laser technology. For the past three years, Facebook has been working with an organization it helped to create, initially called Internet.org and then renamed Free Basics.